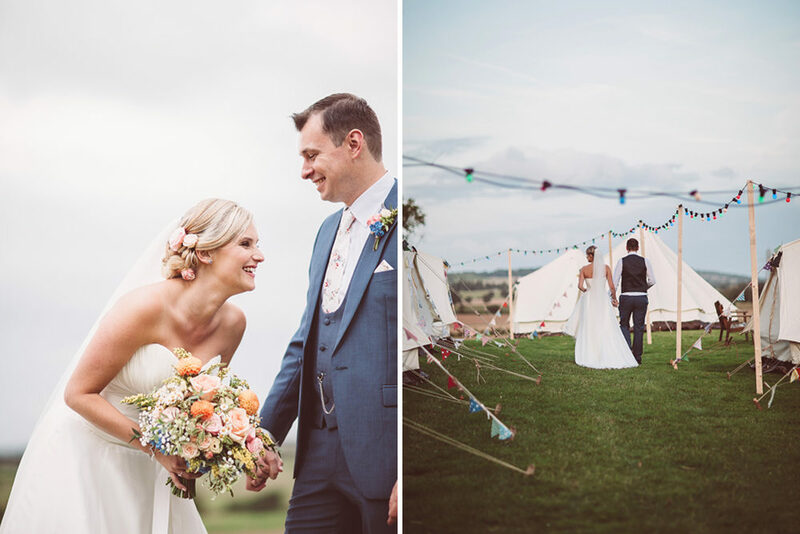 Hayley and Jon are absolute legends, they wanted a rustic barn reception and came across Ode’s, but they also loved camping so filled the open field next to their venue with bell tents and had their own mini festival. They toasted marshmallows, ate cheese, drunk wine and had a ruddy good time. 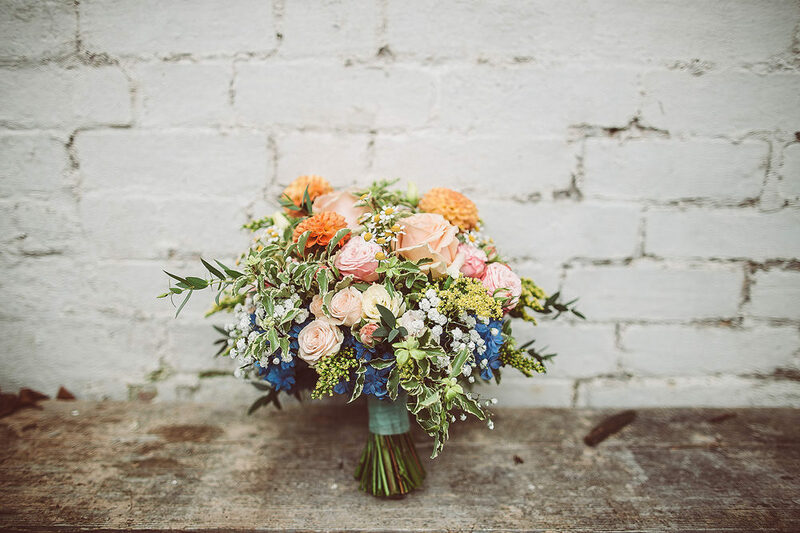 Their colour scheme is absolutely AMAZING, based loosely around the Bridesmaids different coloured pastel frocks with the florist coming up with some truly stunning blooms to compliment them. The bouquets, florals in the ladies hair, buttonholes and centrepieces are all delicious, as is the fabulous use of wine bottles and corks. I bet they had fun collecting those. Hayley’s blush Naomi Neoh Marie gown though….. dreamy, romantic, and practically perfect in every way. 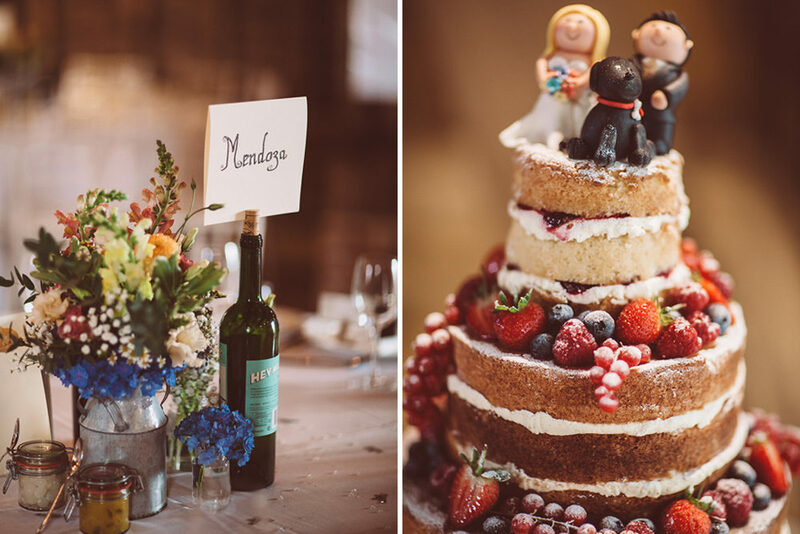 All beautifully captured by RMW fave Lemonade Pictures for you to swoon over. Hayley The Bride: I really had no idea what kind of dress I wanted, all I knew was I didn’t think I wanted strapless. I went to 4 wedding shops and really loved the whole experience, I took my mum, Jon’s mum and Laura my bridesmaid to start and had such fun trying on many different styles, I loved lots of them! There was 1 in particular that just struck me and that was Marie by Naomi Neoh. It was out of my budget so I walked away. Over the next 3 weeks I went to more shops but found myself being drawn back to Naomi’s style. I went to BOA Boutique who stocked a large range of Naomi’s dresses. They were so helpful and had a really big space to walk around in and a mirror in natural daylight which was a huge plus! I tried lots of styles but it was still the “Marie” dress, with the delicate silk fabric that I had fallen in love with. I just loved spinning around in it. The pink flower and the floor length veil with Swarovski crystals really set it off and the whole thing felt really romantic and I just felt really special. I actually brought my wedding shoes for my hen-do and afterwards thought they would be great for the wedding and I knew they were comfortable! We walked past and Jon spotted the 3 piece suit in the window and that was it, he had decided that was the suit! 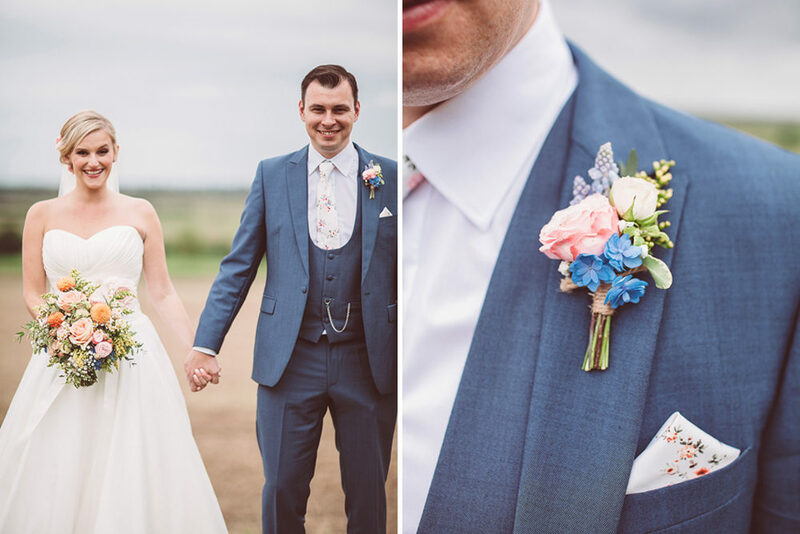 We chose the floral ties as they picked out the colours of the bridesmaid dresses and went with the feel of the wedding. 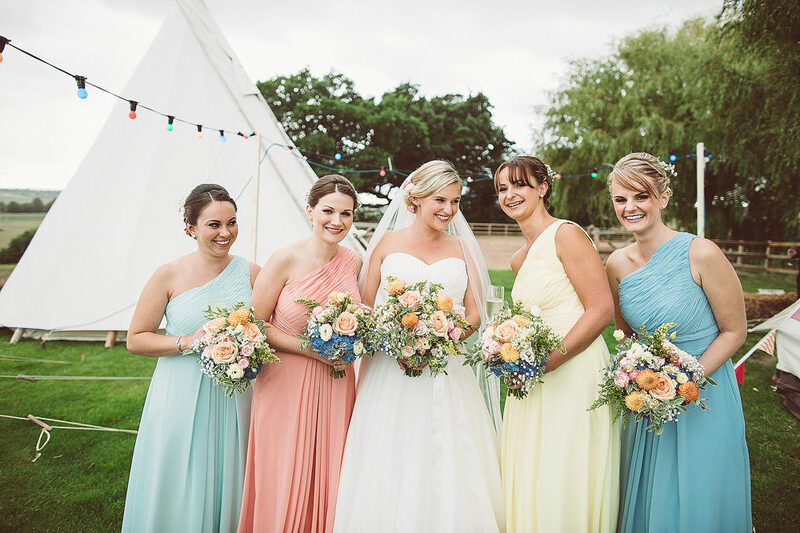 One of the first things I decided was I wanted different coloured bridesmaid dresses, they went with the relaxed romantic feel plus each bridesmaid would suit their coloured dress. I was worried about buying online but I had no reason to be. They provided a great service and were the only place I could find the bright pastel colours I was looking for. They sent colour samples of the fabric and offered custom sizing. 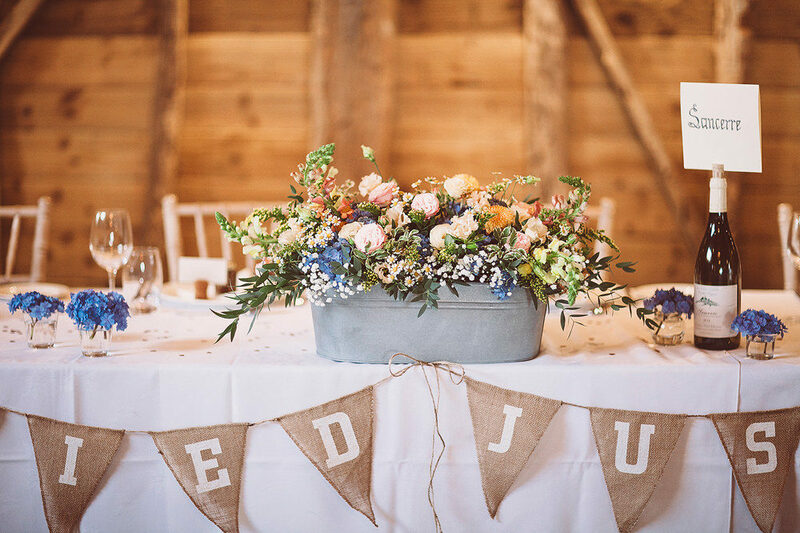 I wanted the flowers to be meadow like and informal to go with the relaxed and natural vibe we wanted for our wedding. I gave Gwenda a picture of the bridesmaid dresses and my dress and she had free reign. Our bouquets & buttonholes were so beautiful. Gwenda and I came up with the idea of the centrepieces in milk urns and jugs (we sourced from Ebay) as we thought it suited the barn. I always wanted flowers in mine and the bridesmaid hair. I chose gypsophila to feature as I remember it growing in my parent’s garden when I grew up. 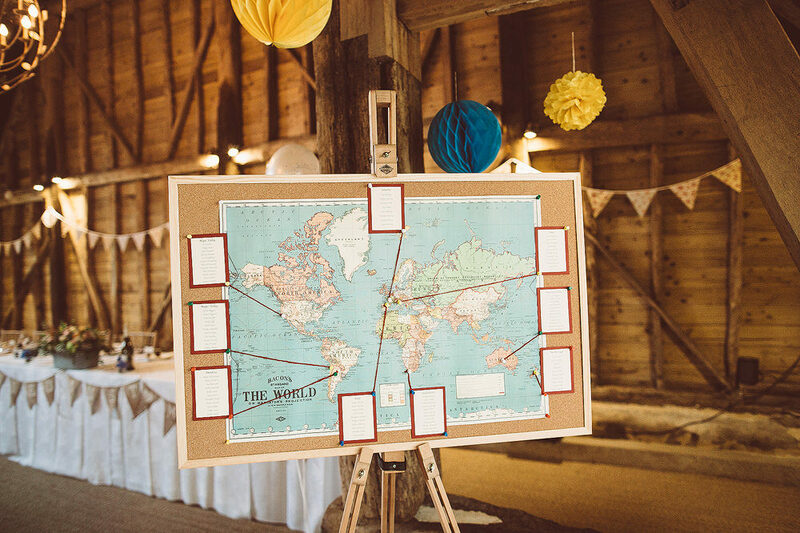 We came up with the idea for our table plan while on holiday drinking a bottle of wine! All of our friends and family know how much we enjoy our wine and we knew it would raise a smile when everyone saw the tableplan. Each table was named after a different wine region, the table names were displayed in a corresponding empty wine bottle from that region and yes we did drink all the wine to get the empty bottles! The last bottle was consumed with Laura while madly making the favours! Jon came up with the map idea and we had lots of fun putting it all together on the Wednesday night with members of our wedding party! We decided to display the placecards in corks. We asked friends and family to save corks in the 8 months preceding, we needed 96 plus ones for the table names! My mum wrote all the place cards, the table names and the front of the menu cards. It was a labour of love! Card table, Jon and I have been together for 12 years and so have pretty much grown up together. I came up with the idea to create a polaroid photo frame of us through the years to go on the card table. What better picture to represent us in 2015 than a picture of us on our wedding day! Nichola (lemonadepictures) brought her polaroid camera on the day & pegged the last pic. The sign “grow old with me, the best is yet to be” went perfectly with our growing together photos. We got married in our local village church. We bought our first home here and still live in it now so it was special to us. I decided I wanted to walk to the church from home very early in planning. I walked through the village with my dad, mum and bridesmaids, it worked perfectly! A few elderly neighbours came to cheer us on our way and beeps from passing cars. We met our vicar several times and knew he would make the ceremony very relaxed which is exactly what we wanted. My friend Becky did a funny reading “he always leaves the seat up” which she had personalised about us. My mum found and read “blessing of the hands”. She was very emotional and it was a very touching moment, I think lots of the congregation were on the verge of tears! We chose to exit the church to Everywhere by Fleetwood Mac, a song we frequently dance around our kitchen to. We had been looking for a Barn for a long time but so many were booked or had tight curfews of 11pm. 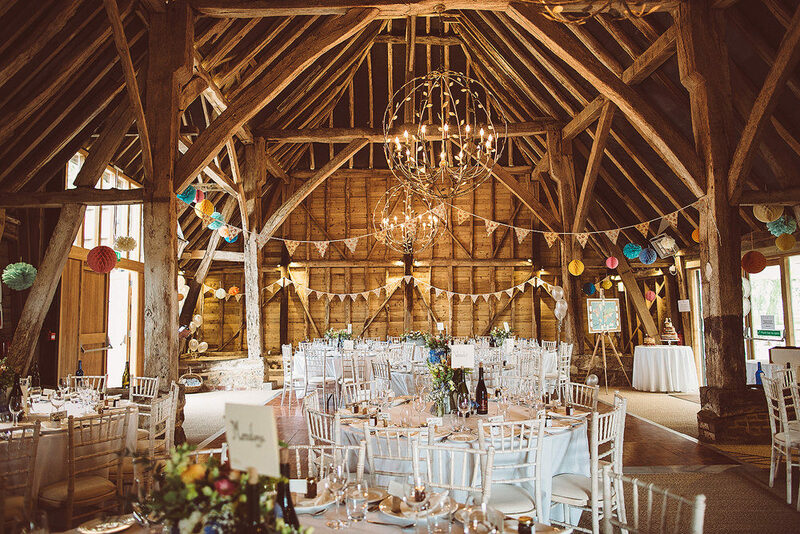 I came across Odo’s barn on A Kentish Ceremony, they were a new wedding venue and when we booked they had only held 1 wedding there. From our first visit we fell in love with the barn. Inside, the stunning central lights and preserved original features of the beautiful building and outside on the patio the views across the Kent countryside were amazing. We knew we had found somewhere that had wowed us and would definitely wow our guests! Robert and Charlotte were lovely & so very accommodating to all our ideas & so helpful. Reception drinks, sorento sparkle and English garden cocktails. We wanted to break away from the traditional 3 course dinner. We came up with the idea of an English Summer Picnic served in a picnic basket in the middle of each table, made up of ham, scotch eggs, chorizo bites, goats cheese tarts, mackerel pate & toasts & basket of breads. We had 3 salads to go with it and some pickles & piccalilli. Desert was one of my favourites Eton Mess and the last course was a selection of cheeses & crackers from Errington Cheese (my friend’s family cheese making business). Our favours were little pots of different chutney. Alex really worked with us to create exactly what we wanted. We chose Chapel Down English Rose sparkling wine for our toast drink which came from just down the road in Tenterden, Kent. Our evening food was pulled pork, bbq sauce, brioche buns, pickles and potato wedges. The food was amazing and Alex very kindly found me and Jon in the evening and made sure we both got food which was brilliant. Jon had 2 bestmen and part of the speech they wrote & performed a rap to the Fresh Prince of Bell-air theme tune. Everyone thought it was brilliant and was a real highlight! 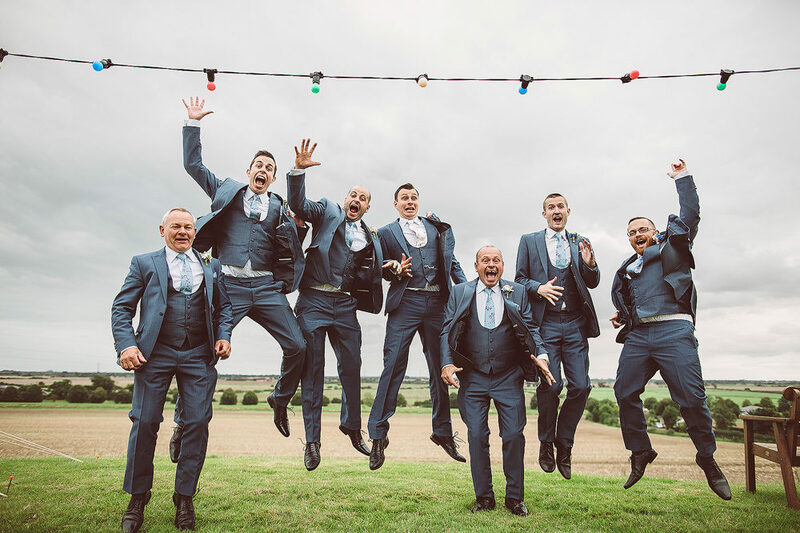 We got some beautiful images of our day and both Nichola and Marcus blended in with our guests and got lots of natural shots which is what we wanted. 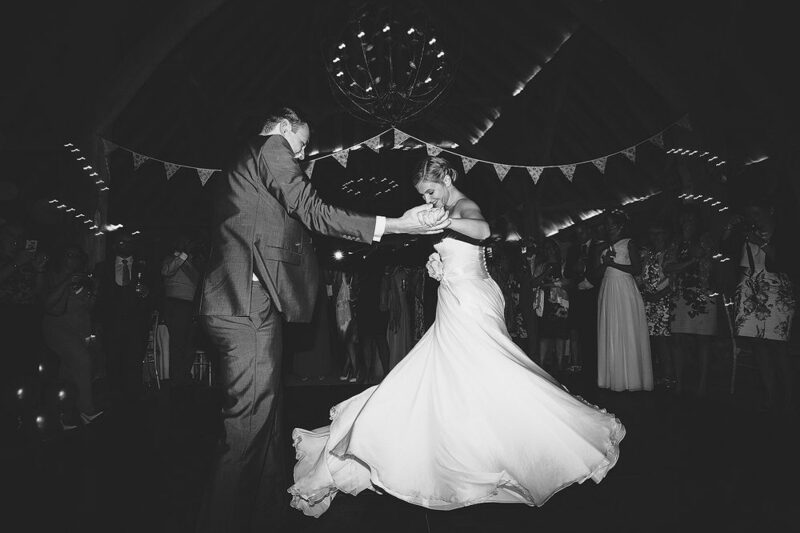 The photos of our first dance and Jon spinning me in my dress are amongst my favourites! After a trip to Glastonbury in 2013 and glamping in a bell tent, the spark for wedding accommodation was there! We love festivals and sitting with friends, music and a warm can of beer is one of our favourite things! On our first visit to Odo’s we spotted the field at the side of the barn and thought you never know unless you ask! Happily they agreed we could use it! We hired the bell tents. We decided to put an upside down apple crate or wine crate as a table in each tent and brightened it with a tinned can of flowers and a few of the essential glamping items, pack of baby wipes, mini torch, bag of sweets, bottled water, chewing gum & paracetamol. As the reception finished all those glamping (including us, me still in my dress!) headed back to the field where we had created our own mini festival, with festoon lights, hay bales, fire pit, marshmallows on skewers for toasting and DJ Karl with his playlist. Later we went in the tipi, ate left over cheese and carried on! I think the last person to bed was 5am. The next morning, we arranged with Odo’s to provide breakfast it went down very well! We had just under 40 people glamp (including our parents!) The day before the wedding I walked through our mini festival and was so happy, it had turned out exactly as I had pictured it! Enjoy the run up to the wedding! I have so many wonderful memories from the week leading up to the wedding. Throughout the day remember to take a couple of moments together to look around and take in it’s your wedding day. You have to make a conscious effort to come together but it’s so important! You will never remember every detail of the day, there are too many things happening so make sure you get everyone to take lots of photos, particularly in the evening when the party really gets going! Don’t stress over the small stuff, you honestly won’t worry about it on the day, you just have a permanent smile on your face seeing all your friends and family enjoying everything you have created. Finally, enjoy it and relax! You will miss it when it’s gone!